One Voice Music is proud to have a number of highly talented percussionists, singers and dancers to teach on their workshops. They are respected both as artists and as excellent teachers. OVM often brings tutors together to teach in collaboration on the same workshop which greatly benefits the students. Founder/director of One Voice Music & main tutor on all modular courses and one-off workshops. An all round percussionist specialising in the traditional drumming in Afrocuban & Afrobrazilian music. Ravin joined the Manchester based percussion group Inner Sense in ‘91 after completing a Popular Music and Recording Course in Salford, Manchester. Over the last seventeen years he has specialised in Brazilian and Cuban percussion and has focussed on the more traditional styles from these two countries. He has made several research / study trips to Cuba and Brazil and has worked with many UK & international artists including Amelia Pedroso, Arturo Martinez, Santiago Garzon Rill & Leonardo Pancha Clara (members of Clave y Guaguanco), Marta Gallaraga, Reynaldo Lopez, LaTimbala, Murah Soares & Dudu Tucci. 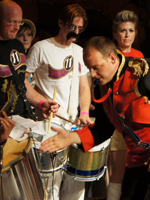 As a teacher, he has led a number of percussion workshops throughout the UK and in several other parts of the world. For OVM, he runs a modular course for beginners and two courses for intermediate levels, one in Afrobrazilian percussion and one in Afrocuban. He also teaches special one-off workshops focussing on a particular instrument or music style and teaches on holiday percussion workshops in Tuscany & Sicily. Regular invitations from Community Samba Groups keep him extremely busy. He is often asked to run workshops that combine technical development with his own creative percussion arrangments. A current focus is the Edun Ara – bloco de carnaval project that he’s working on in collaboration with Brazilian dancer, Marcia Magliari. Ravin has recently won a UK National Training Award. At a Gala Ceremony in London, he was presented with the highest level of award in the UK. Click here for details. Dance instructor on the Edun Ara – bloco de carnaval project and other OVM workshops. Marcia Magliari is from Rio de Janeiro, Brazil. She teaches Samba, Afro-Brazilian, Frevo, Forro, Lambada, Gafieira (samba ballroom), Salsa, Merengue & a Stretch class. She is an experienced dancer, teacher & choreographer who since 1986 has been working for Brazilian Contemporary Arts helping in the expansion of the notion of Brazilian Dance (especially Lamabada) & Music in the UK. Marcia has been trained in classical ballet, jazz, contemporary, dance movement therapy and studied yoga and tai-chi. She has a Diploma in dance movement therapy and is a pioneer of Brazilian dance in the UK. She combines all this knowledge and expertise to give her classes a special blend, linking body awareness, technique and the joy of dancing. Joint tutor on the Bata y Rumba and Camp Iroko workshops and guest tutor on the ‘Afrocuban Percussion Studies’ course, offering tuition on Bata, Rumba, Timbales & Bongo, teaches songs and assists with each group’s end of course performance. Dave Pattman is highly respected for his musicianship and knowledge of folkloric and popular Cuban music. He has played, recorded and composed with Paul McCartney, Django Bates, Alex Wilson, Omara Portuondo, Cachaito Lopez, Cubanismo and Anga Diaz. He is a highly sought after session musician who is involved in many groups including Dilanga, The London Lucumi choir, Snowboy and Alex Wilson. Vicky is a joint tutor on the Bata y Rumba and Camp Iroko workshops and lead singer on OVM’s Edun Ara project. She is a singer and percussionist with a deep passion for Afro- Cuban Folkloric music and the director of Bombo Productions which promotes Afro-Cuban folkloric music through Performance and Education. She has performed as a lead singer for the Bristol Cathedral, Rumba Orisha & with a 500 strong choir for the Thames Festival. She currently works with Dilanga & Orchestra Bombo. Joint tutor on the Brasil de todos os ritmos course. Known to everyone as J P, he has gained a reputation as a calling card for the modern sounds of the Carnaval Carioca (Carnival of Rio de Janeiro). Hailing from Ireland (go na ya good thing), he has a deep knowledge and technical ability on all the instruments of the bateria. His ability to pass on his knowledge is immortalised in the vast numbers of students who have passed through the door’s of his workshops. J P is one of the most popular educators of Brazilian percussion in the UK and has also been instrumental in the setting up of new and very successful groups. His technically precise and challenging methods continue to be enjoyed by musicians all over the UK and further abroad. Having studied and performed with major names in the Brazilian carnival world J P is always well placed to give the most up to the minute information on what’s happening on the ground in the Brazilian Carnival world. J P is also a member of one of the UK’s only Rumba groups (Dilanga). The group is made up of people who are spearheading London’s flourishing Latin scene. He can been seen there playing various percussion instruments and singing. Not only a percussionist, J P is also an event organiser and is the Artistic Director of the Luton International Encounter; a festival of Brazilian Carnival music with international artists from all over the globe and based at the UK Centre for Carnival Arts. He is also known for his ability in setting up community groups. J P has played and studied with – Monobloco, Bangalafumenga, Kizomba, GRES Academicos da Rocinha, Dudu Tucci, Raz Jayasuriya, members of Clave y Guaguanco, Los Rumbers de Cuba, Conjunto folklorico de Cuba, Afro Cuba de Matanzas, Los Muniquitos de Matanzas and many many more. Guest tutor on the Afrobrazilian Percussion Studies course offering specialist tuition on Maracatu and other Northeast Brazilian rhythms. Holly is a percussionist from Manchester with over 11 years experience in world percussion. Her passion is for Brazilian music, especially the powerful and rootsy rhythms of the Northeast (namely Maracatu Nação). She founded percussion and dance group Juba do Leão in 2005, and the group has since supported MONOBLOCO on their 2007 tour. She also tutors ‘Meninos, Oldham’, a youth percussion and dance group, teaches drum kit to teenagers with behavioural problems, and performs with ‘Carcophony’; a street theatre and drumming performance group. She has played and studied intensively in Brazil with various groups and percussionists, and has played in the Recife Carnival with ‘Maracatu Nação Almirante do Forte’ in 2005 and 2007. She regularly holds workshops throughout the UK sharing her vast knowledge of traditional and modern Brazilian musical styles. Guest tutor on the Afrobrazilian Percussion Studies course offer specialist tuition on Samba Reggae from Bahia and Axé Novo from São Paulo. Leon has been playing Brazilian and west African percussion for over 14 years, studying intensively in Brazil, The Gambia and Europe. Meninos Oldham, which offers free tution in a range of art forms and is dedicated to bringing alternative arts and culture to young people in the northwest of England. In 2008, Leon set up Global Grooves an organisation dedicated to the development of international music and dance and delivering new, unique and professional training courses for the UK’s percussion and dance community. Leon is also artistic director of Bangdrum Workshops which offers a range of training in percussion, dance and song. Guest tutor on the Afrobrazilian Percussion Studies course offering specialist tuition on Samba, from traditional styles to Pagode covering various other related forms, their origins, history and development. Bosco is considered by many to be Europe’s leading Brazilian percussionist. Born in 1952 in Belo Horizonte, a city in Brazil north west of Rio. He was surrounded by music from an early age, hearing drums being played right outside his house. He came to England in the early eighties and established the London School of Samba in 1984. He has been a huge influence in the promotion of Brazlian music in the UK ever since and has performed in many international and UK based groups. Guest tutor on the Afrocuban Percussion Studies course offering specialist tuition on Cuban carnival music. Howard is a multi-instrumentalist with exeptionally diverse experience in live and recorded music, improvising and experimentation also collaborating within theatre, circus and dance. He co-directed and arranged for Orquesta Timbala’s formidable 30 piece mozambique big band and also for the timba group Mojito. Howard has played drums/percussion/clarinet/saxophone/bass for experimental bands such as Homelife, Toolshed, Lotus Pedals, RSL,The Nobodies but also for the Royal Liverpool Philharmonic Orchestra, Manchester Camerata, Cornelius Cardew Ensemble and notably in New York with the Chinook Clarinet Quartet. He has on-going collaborative relationships with Forkbeard Fantasy Theatre Company and Stumble danceCircus, teaches at Leeds College of Music and is currently playing with the spectacular french drumming/fireworks group, Les Commandos Percu. Inspired by the flute playing of Richard Egües from the legendary Orquesta Aragon, Sue Miller set up “Charanga del Norte” (Charanga from the North) in November 1998 and went to study Charanga in Cuba with Richard Egües in 2000 and 2001 and has been back to Cuba on research in 2006 and 2007, playing with top Charanga bands Estrellas Cubanas, La Sublime, Orquesta Barbarito Diez and Charanga de Oro alongside Buena Vista flute player Polo Tamayo. Charanga de Norte are a spirited, energetic UK-based Charanga band. The group is led by the flute and violins with the line-up completed with vocals, electric bass, piano, cello, timbales, congas and güiro. Andy Carter is a multi-instrumentalist, based in the West Midlands, specialising in strings and percussion. He was classically trained from a young age; playing in orchestras and jazz groups before discovering Brazilian music in 2008. He took over directing and teaching the percussion group Bloco Louco (Birmingham) for three years before founding Nova Guarda, a bloco moulded in the style of Monobloco. His cavaquinho, 7 string guitar and bandolim (the Brazilian mandolin) lend a unique flavour to the group. For the past 6 years he has travelled to California Brazil Camp, regularly studying with Ailton Nunes (Mangueira), Jorgao de Oliveira (Mocidade), Jorge Alabe (Grupo Samba Rio) and leading choro artists and composers including Alessandro Penezzi, Rogerio Souza (No Em Pingo D’agua) and Vitor Goncalves. He is a passionate promoter of the growing choro music scene in the UK. Fabio Allman or Fabão, as he is known to his fans, is a Brazilian singer, songwriter and percussionist. Amongst many others he has worked with Monobloco, Bangalafumenga, Cássia Eller, O Salto, Duo Carioca and most recently his new Bloco DuRio. His role as a singer with Monobloco saw him at the forefront of the “revitalization“of the street carnival scene of Rio de Janeiro with crowds of in excess of .5 million turning up at 9am! As a performer and educator he has been to the UK every summer since 2007 spreading the music of the modern Brazilian carnival. Over the course of the weekend Fabao will be teaching some of the most popular carnival songs used by the most famous Blocos and Samba schools in Rio. These sessions will be accompanied by Cavaquinho.